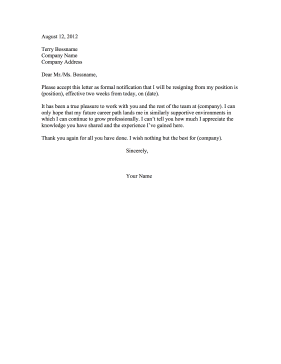 This formal resignation letter is official, polite, positive, and includes a two-week notice. Please accept this letter as formal notification that I will be resigning from my position is (position), effective two weeks from today, on (date). It has been a true pleasure to work with you and the rest of the team at (company). I can only hope that my future career path lands me in similarly supportive environments in which I can continue to grow professionally. I can't tell you how much I appreciate the knowledge you have shared and the experience I've gained here. Thank you again for all you have done. I wish nothing but the best for (company).